If you are looking to buy natural magnetic lodestones, look no further. On our site you can order various sizes of lodestones in small retail orders or wholesale quantities. Be sure to check out our Premium Stones to see some of the best quality lodestones we have. Lodestones are magnetic rocks made of a mineral called Magnetite. Magnetite is made-up mostly of iron. A piece of Magnetite that has become magnetic is called a Lodestone. Read more about lodestones. Life Studies also sells other amazing Earth Items. Like the Kids Favorites Collection. Years of cub scout day camps have proven these items as favorites. Please visit our Earth Items Page. Wholesale orders must be for 20 pieces or more. Discounts are based on quantity. Sizes range from 1/2 inch to 2 inches. Wholesale orders are great for classrooms or groups. Save big by ordering in quantity. Shipping is normally via USPS or UPS. For International orders please contact us before ordering as additional Shipping & Handling will need to be added to the order. Our products are 100% guaranteed. View our policy. Life Studies - Special Deal! Now only $6.95. 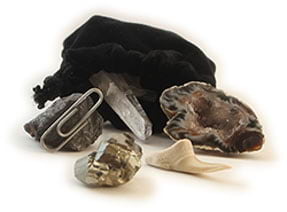 Includes: Shark Tooth, Fools Gold Nugget, Quartz Crystal, Natural Rock Magnet, Crystal Cave, info about each item and a cool drawstring bag.